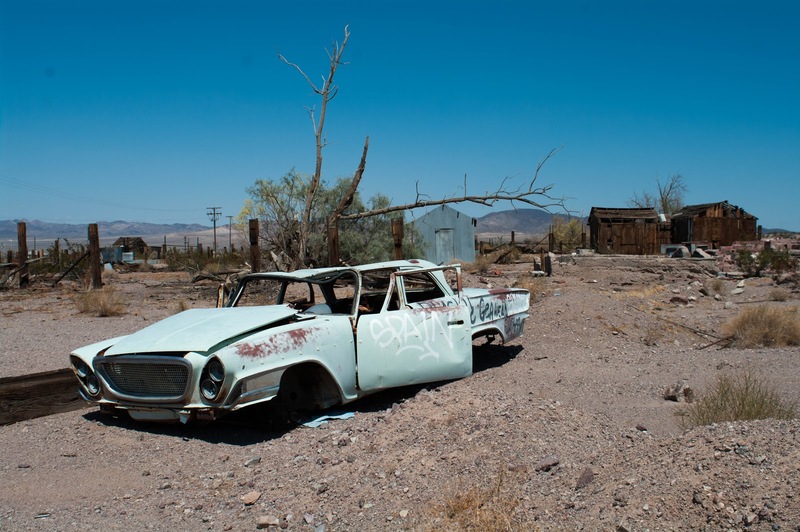 So, yesterday was a chance to drive again my favourite stretch of Route 66 - and the first stretch I ever drove. 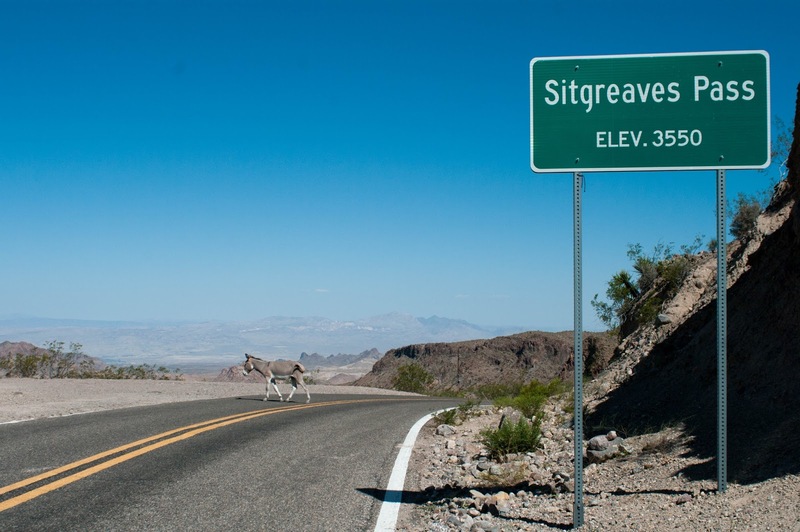 The initial stretch from Kingman was to Oatman, one of the first places to be bypassed, back in 1952. Oatman used to be a rich mining town - rich enough to ensure that Route 66 was diverted up through the mountains to serve it. This section of road had a dreadful reputation, all narrow winding switchback roads with no barriers and many long drops. It's challenging enough in a modern car - what it was like in a 1930s Chevrolet I can't imagine. When the gold ran out, the road planners couldn't bypass the place quickly enough, building a straight, smooth road through the river valley. It's a great drive though, although you can't be in a hurry. The road is well made, but still winds, snake like. There was more traffic than when I did this route before - but that's been true across Route 66. I'm glad tourism has picked up and all these little businesses that survived are earning a little money again. Although a selfish part of me liked the feeling of discovery and being alone on these roads. Oatman looks like a movie set for a Western, but it's the real thing, complete with pesky burros wandering the streets. It's hard to believe now, but Clark Gable and Carole Lombard came here for the honeymoon*. 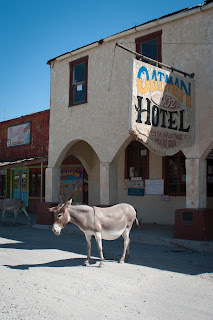 They stayed at the Oatman Hotel, whose only guests now seem to be the wild burros. From Oatman, it's a drive across the desert to Needles (named after a local rock formation), where I stayed on my previous road trip. I was very pleased to see that the ruins of the old Harvey House hotel have now been completely restored into a beautiful station building. I must find my old photographs. Again, this added to the feeling of regeneration I'm seeing across some stretches of the old road. There's a tiny bit of I-40, before I leave the road again to head to Goffs. Now I'm driving along side the Santa Fe railway, keeping pace with the huge, mile long trains, while the I-40 takes a more direct route across the desert. Goffs was once a refuelling stop, but no train has stopped there for years. 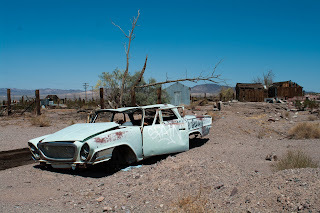 With no railway, and no Route 66, it's now a ruined general stores and a lot of trailers. I can't help but wonder who lives out here. The road now curves back to the I-40 - and a stretch of road I got to do for the first time. Previously, the road to Topcock was closed, but now I got to drive this wonderful, empty stretch. 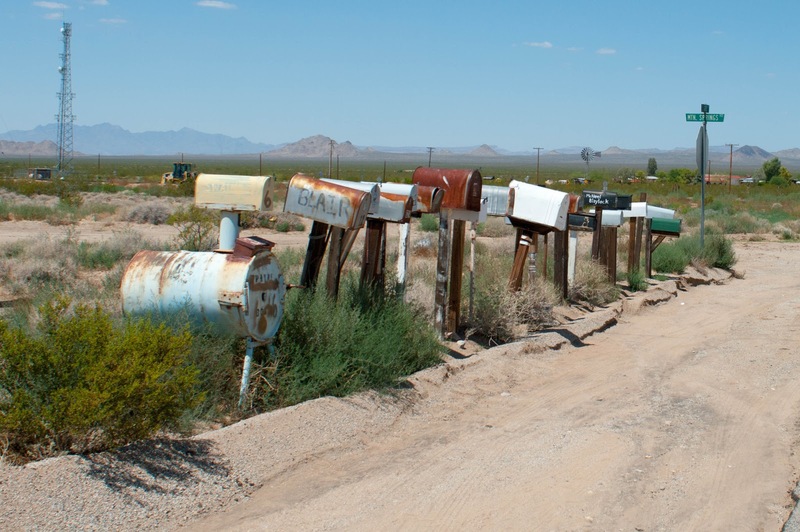 Alas, the gods of Route 66, they give and they take away. Now there's a stretch of the road I can't do, from Fenner to Cadiz, as they're doing resurfacing work and replacing some bridges. So I bomb along the I-40, turn off at the Kelbaker road and zip down to Amboy. Amboy houses the iconic Roy's. This is a modernist motel with a huge pointed sign like a beacon in the desert. The place closed years ago, but not allowed to disintegrate. Instead it earns its money as a location for adverts and pop video shoots. A picture of it won the Sony World Photography awards this year - much to my amusement - I should have entered some of my pictures of it! I did get a bit grumpy with a family of tourists though. When I arrived, I parked my car a little way off so it wouldn't be in anyone's photos. But as I did, this huge black SUV arrived, parked directly under the sign and disgorged its family. They all took photographs, and then the father sat under it, in the shade, smoking a cigarette. A bit of smiling and hand waving and miming eventually got the point over. After much apologising, they moved their car so I could take an SUV-free photograph. It's a good picture, but not as good as the one that won the award. Next, it's time to hunt some ghost towns. Bagdad is just a tree, in the middle of nowhere. Siberia is a few bricks and a tyre with the name of the town on it stuck on a pole. Then it's Ludlow. Ludlow is the plucky town that will not die. First it was a train stop that grew into a thriving little town. The general store was run by a frightening matriarch with a tendency to shoot first and ask questions later. When the trains no longer need to stop there, they picked up the town and moved it north, to straddle Route 66. 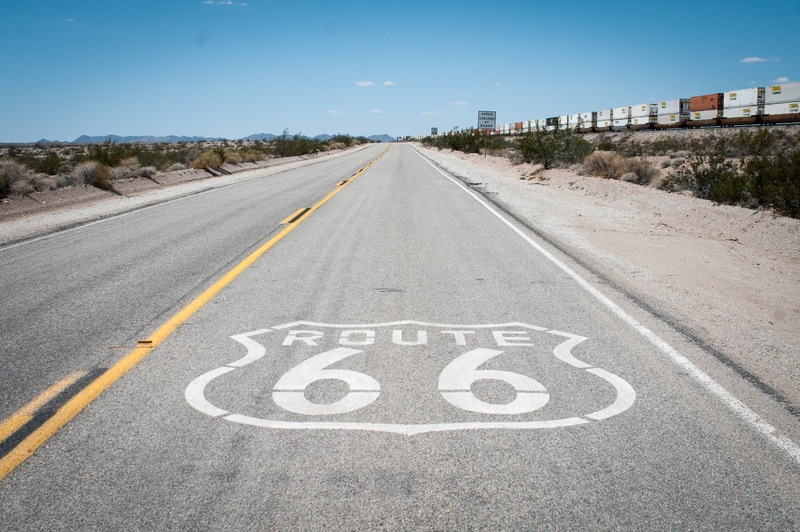 When Route 66 bypassed them, they moved it north again to service the I-40. 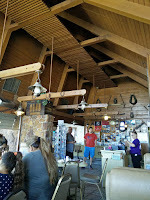 There's still a collection of gas stations, a rather good little cafe and a motel I was tempted to stay in. In the end, I couldn't resist the temptation to get a little more Route 66. 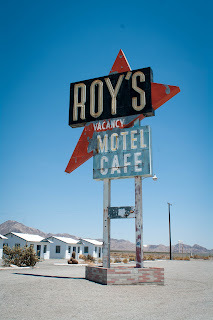 I shot down to Barstow, where I am now, staying in a Route 66 themed, Bangladeshi run, motel! 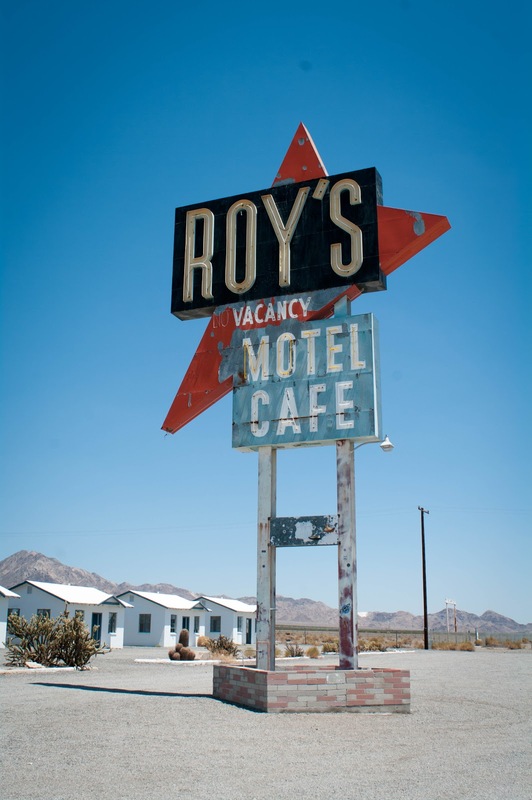 "I have to say that, despite the set up room and the lovely legend, that Clark Gable and Carole Lombard spent their honeymoon (or even the night) at the Oatman Hotel is sadly, just that - a legend invented by an enterprising hotel owner! They were, however, married in the Methodist Church in Kingman on 29th March 1939. 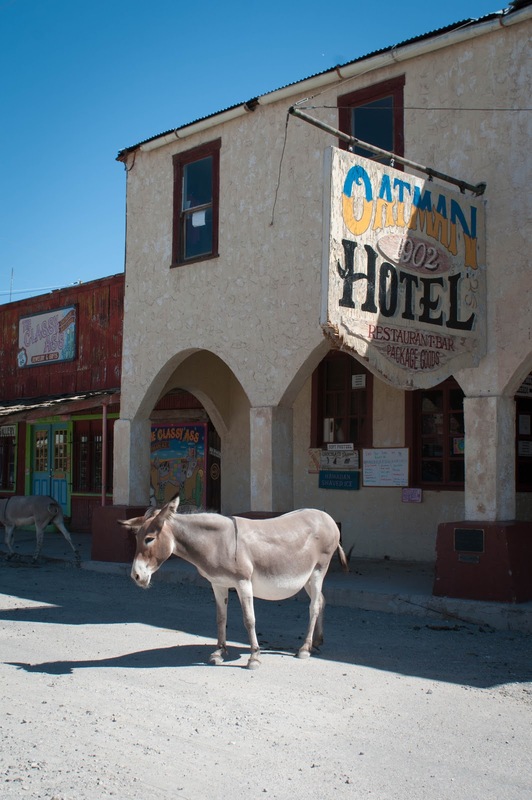 The Oatman Hotel owner got his facts a little squirrelly because a sign in the hotel reads that they spent their wedding night of 18th March there! What actually happened was that, on a day off from Gone With The Wind, Gable and Lombard drove to Arizona, got a marriage license from a very surprised Miss Viola Olsen, the clerk, were wed a hour later and then drove straight back to Hollywood where the news was announced at Miss Lombard's home in Bel-Air at a press conference early the next morning." This is a classic stop on Route 66 - but maybe if you're not aware of that, you might not get it. It's a timewarp place, serving simpler diner food. I had a cheeseburger, the service was friendly and I seemed to be the only person in there that wasn't French. The complete lack of windows can make this place look a little off putting from outside. The dated hacienda decor inside - and the lack of customers on a Wednesday night - didn't really reassure me either. But do you know what, the food hit the spot. 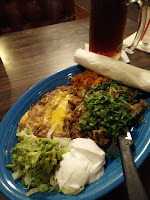 I had the carnitas, it was simple, old school and tasty and washed down by a huge glass of beer. I left full and happy!